This weekend is the Anahaim Comic Con – a convention of Sci Fi, comic and fantasy fans, artists and producers. I went there to shoot yesterday, and it was a pretty amazing experience. 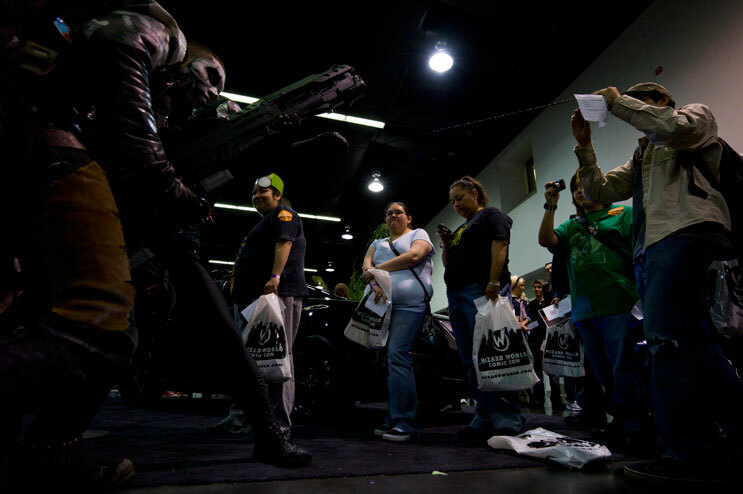 Overweight batmans posing for pictures with kids, tired Dumbledores in a coffee shop, baby Supermans with their parents – you name it, the Comic Con has it. Here are some of my selects from the day. As always, I’m happy to hear your thoughts! Cat 'Shaolin Punk' Parsons, of the OC Roller Girls Roller Derby team, fixes her make-up at the Wizard Mountain Comic Con at the Anaheim Convention Center, April 30, 2011. Donning a mask with Twilight character Jacob Black's face, J.R. Hipolito, center left, plays against Darren Newton during a promotion of the video game Marvel Vs. Capcom III at the 7evens Gaming stand. 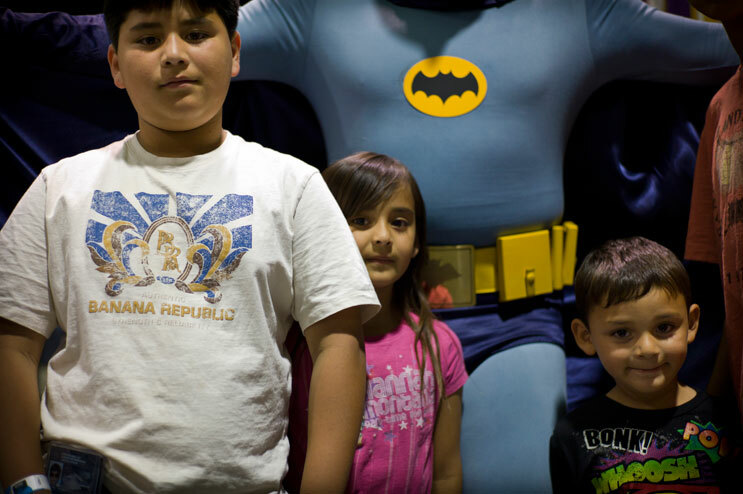 From left, Adam, 9, Allison, 6, and Anakin Bautista, all of Lynwood, Calif., pose for a portrait with Batman (a.k.a. John Whitt, of Minneapolis, Minn) at the Anaheim Comic Con. "I like to meet the movie stars and the action figures," said Angel Bautista (not pictured), the children's father. Visitors of the Wizard World Comic Con take pictures of cosutmed superheroes. 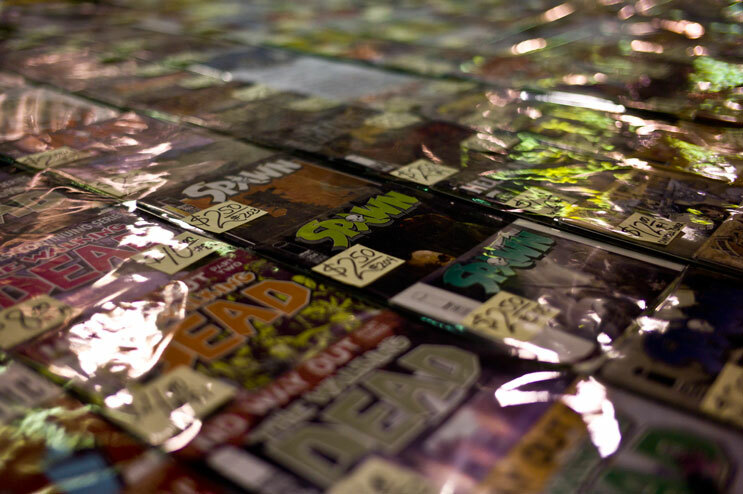 Comic books are displayed for sale. 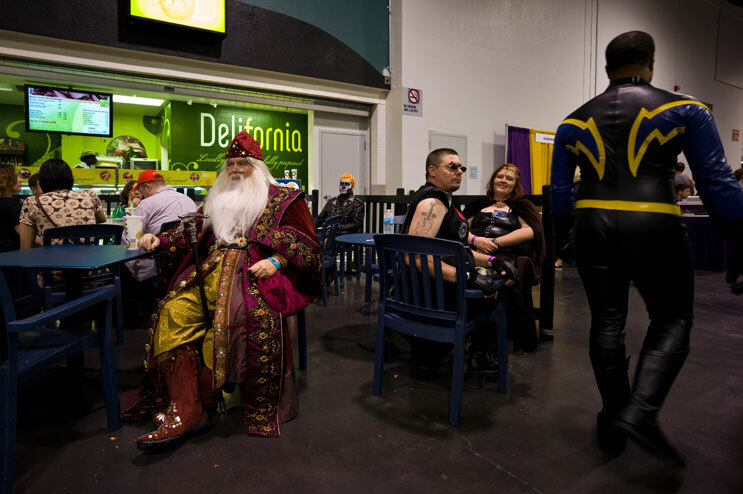 Shaunn Lawrence, left, of Los Angeles, takes a break in his $1,200-Dumbledore costume. Lawrence, a professional costumer for 33 years, made the costume himself after taking measurements and sketches off the original during an exhibition at the Academy Museum of Motion Pictures in Beverly Hills. "I had to use cotton gloves when I did it," he said. Autumn Will, left, as 'Giganta,' and her boyfriend Cesar Vargas, as 'The Flash,' pose for a portrait at the Wizard World Comic Con at the Anaheim Convention Center.